The facts of Africa’s rapid urbanisation are startling. By 2030 African cities will have grown by more than 350 million people and over half the continent's population will be urban. Yet, in the minds of policy-makers, scholars and much of the general public, Africa remains quintessentially rural. This lack of awareness and robust analysis makes it difficult to make a policy case for a more overtly urban agenda. As a result, there is across the continent insufficient urgency directed to responding to the challenges and opportunities associated with the world’s last major wave of urbanisation. 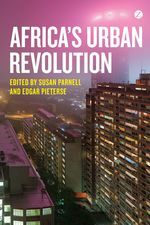 Drawing on the expertise of scholars and practitioners associated with the African Centre for Cities, and utilising a diverse array of case studies, Africa's Urban Revolution provides comprehensive insight into the key issues - demographic, cultural, political, technical, environmental and economic - surrounding African urbanisation.